Posted: Tue Sep 11, 2018 10:25 pm Post subject: Longest sole owner ? This is the only surviving toy from my childhood. It resides on the desk of my home office. Over the years it has sometimes been the topic of conversation with family and friends and whether or not to have it restored. There was a time when I had considered having it done but in recent years and especially in the last few months I have moved away from the idea. It is what it is. This little truck, along with the owner and "inter vivos" share the ageing, knocks and tapestry of life. Those are YOUR dents & dings & scratches. ( & YOUR memories - I don't think memories can be restored, can they?). Thats a lovely toy, my Father still has a few of his Dinky toys all in play-worn condition. Unfortunately my earliest road vehicle 'died' a very long time ago. I do have a Victory Industries Put-Put boat called 'Miss England'. I believe that these were later powered by a battery-electric motor and were only put-put boats for one year about 1947/8. Mine was given to my older brother in about 1947 and passed to me in 1950, Here is a photo, not mine as my own boat is packed away for now. 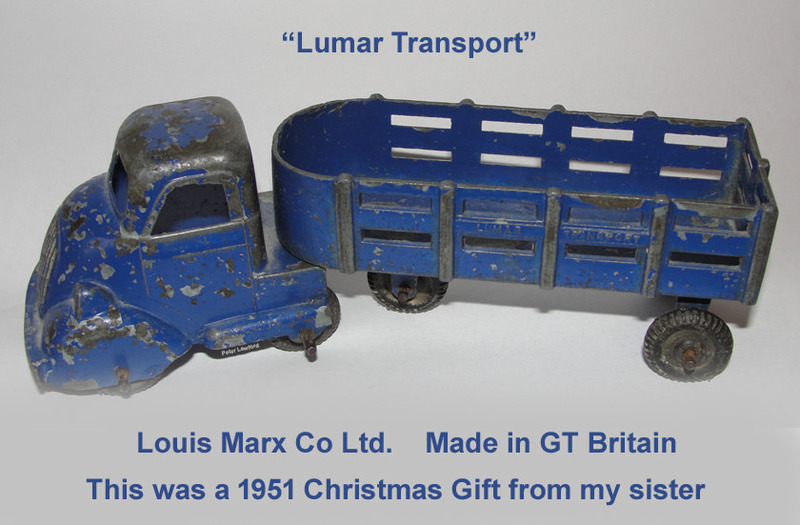 I have no idea what brand the two wheeled toys that I remember, perhaps someone here might know of them One was a pressed metal London trolley bus. It was clockwork and once wound and set down, it would run forwards for a few feet, then stop and after a second or two run forwards again, repeating that until the spring ran down. The other was a steam roller. again it was clockwork. It would roll forwards and backwards several times, then run forward for about double the previous distance- to a 'new' section of road, then repeat the back and forth, before running forward again.